Sarah and her mom, Tamara, traveled from Detroit to be at the Women's March on Washington. 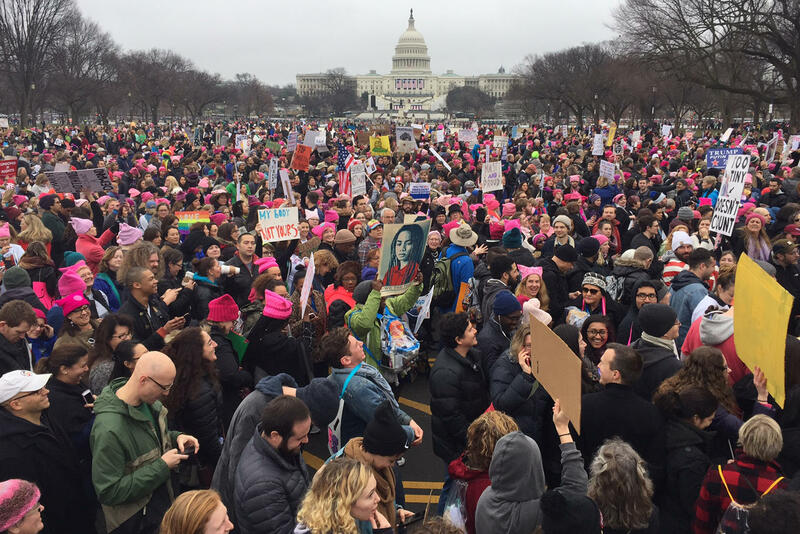 Demonstrators protest on the National Mall for the Women's March on Washington. Marchers gather outside the National Museum of the American Indian, bearing signs protesting President Trump. 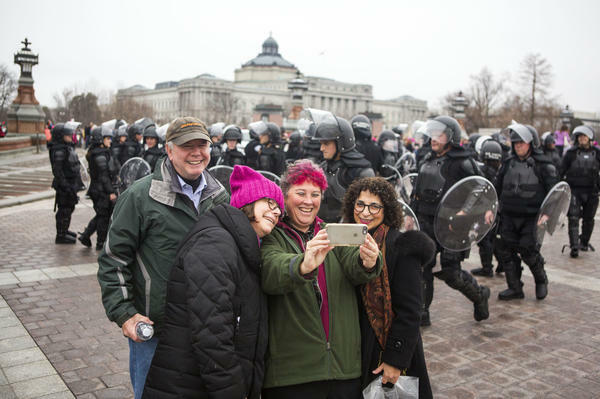 Protesters take a selfie with the police as a backdrop outside the U.S. Capitol during the Women's March on Washington. Protesters arrive at the Capitol South Metro station for the Women's March on Washington in Washington, D.C. 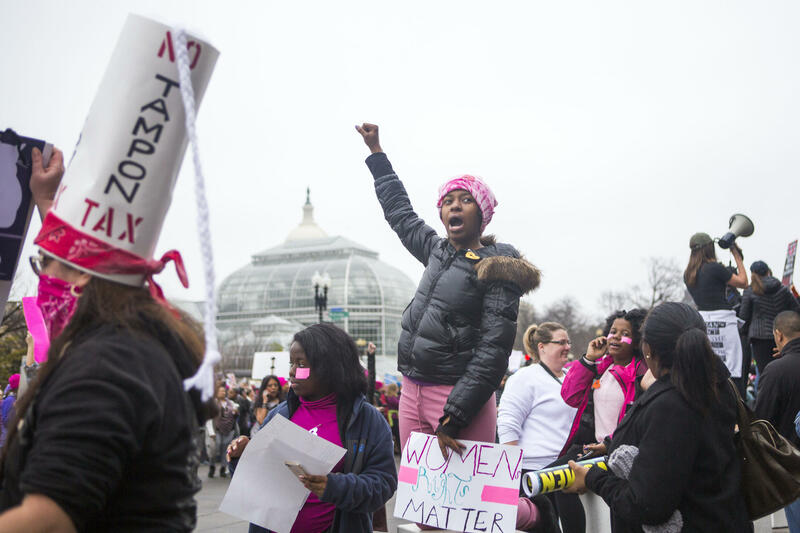 Protesters attend the Women's March on Washington in D.C. 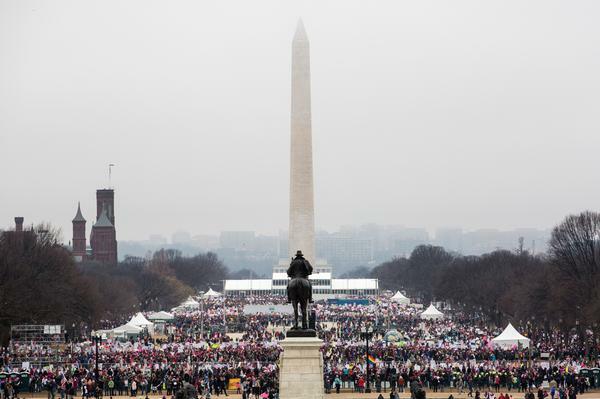 Protesters crowd the National Mall during the Women's March on Washington. 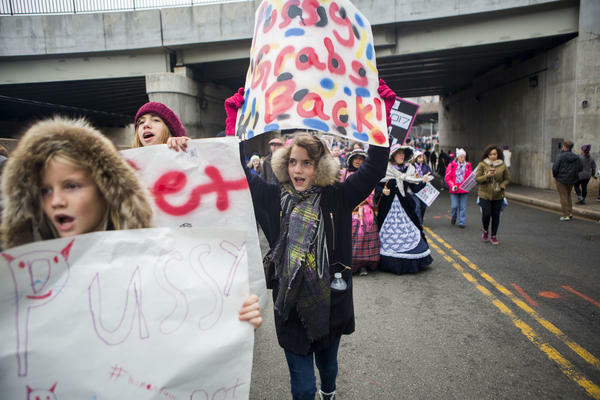 Protesters display their signs in Washington, D.C., during the Womens March. Protesters march in Washington, D.C., with the Capitol in the background. Protesters march down a D.C. street during the Women's March on Washington. 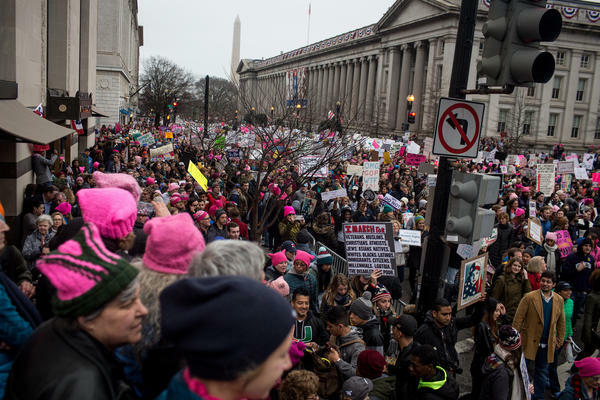 Women with bright pink hats and signs gather early on Saturday in Washington, D.C., for the Women's March on Washington. Chris and Susannah Kisrarday traveled to D.C. from Lewisburg, Pa., with their kids Zoitan, Ceili, Catherine and Ellie. (Right) Rosa Plume traveled from San Francisco. 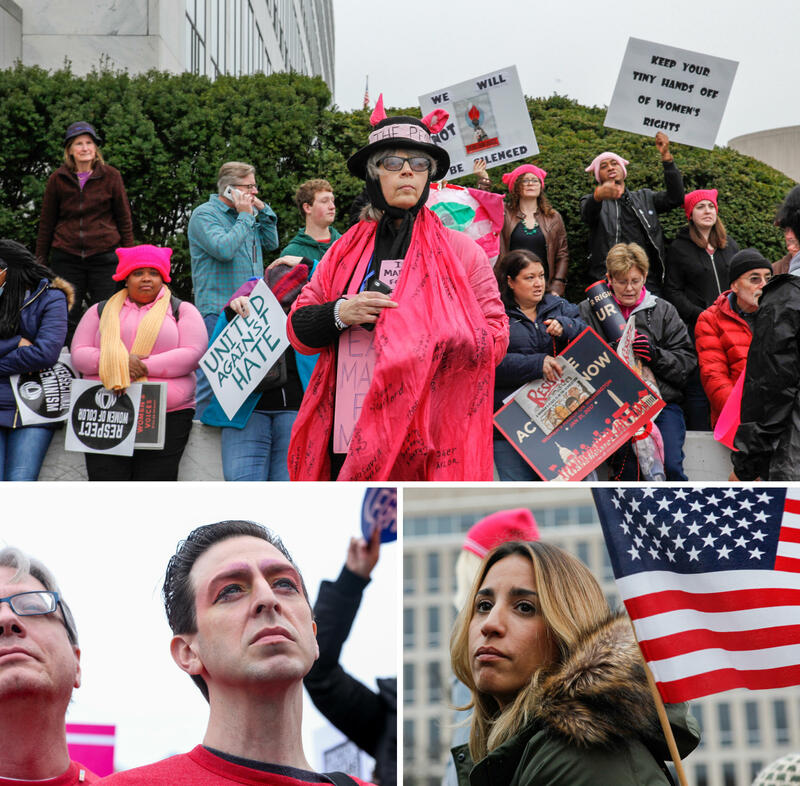 Many protesters wore pink or other feminist iconography at the Women's March on Washington. 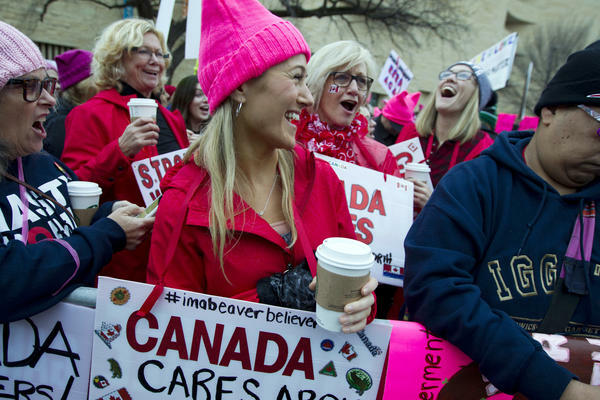 (Left to right) Melissa Breen, Laura Jamison, Sandy Cuza and Kathryn Wehrmann chat while sporting matching pink hats in support of the march. Protesters march near the U.S. Department of the Treasury. (Left to right) Nadia da Rosa, 15, from Providence, R.I.; Anna Maria Evans from Durham, N.C.; and Nicole Monceaux from New York City attend the Women's March on Washington in D.C. The city's metro system reported 275,000 rides as of 11 a.m. According to metro officials that's eight times more than a normal Saturday. Reuters adds that the number is also "82,000 more than the 193,000 rides reported at the same point on Friday," the day of Trump's inauguration. 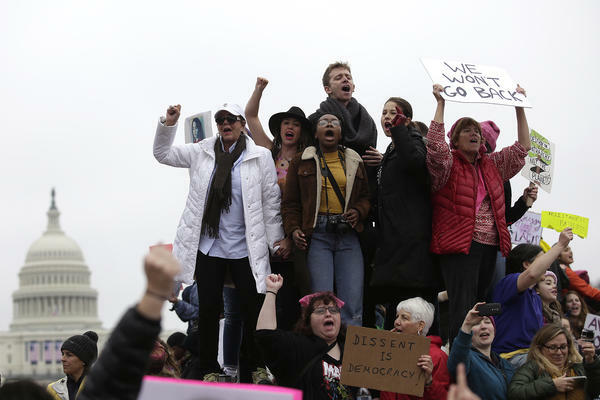 In fact, the number of marchers swelled to the point of prompting reports there would be no space for a formal procession — a claim rebutted by organizers Saturday afternoon in a statement. "We are marching," reads the statement. "We are marching straight ahead toward the Washington Monument to the ellipse of the White House." The event grew from humble origins — a simple Facebook invitation after Election Day — to the much more massive demonstration seen Saturday. 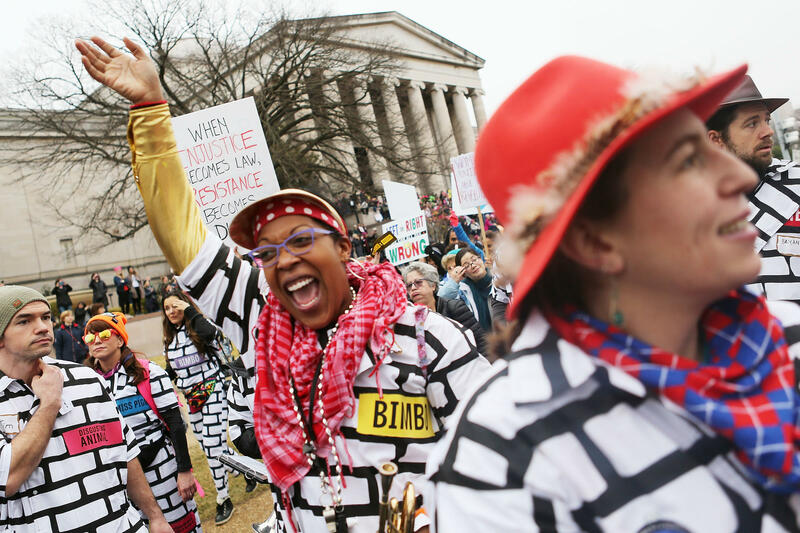 By the time marchers hit the streets, the Women's March on Washington developed a broad platform of progressive political positions, a slate of celebrity performers and a series of sister marches planned across the world — on all seven continents. 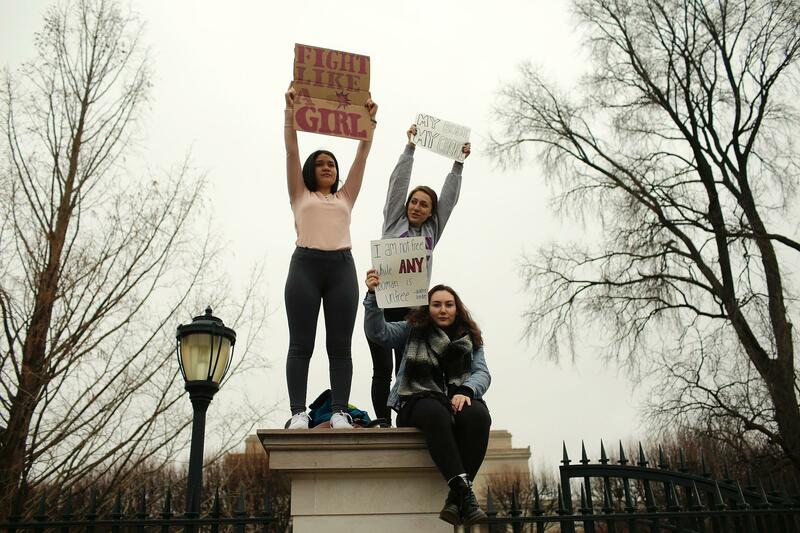 For protester Amy Jackson, though, the matter was simple: She just wanted to "make her voice heard," she tells NPR's Marisa Penaloza. Jackson, who traveled to D.C. from Chocowinity, N.C., to be part of the march, said, "It was very important to be here today." Among the crowd that gathered for the rally outside the National Museum of the American Indian, NPR's Sarah McCammon reported signs supporting a wide array of causes — from women's rights and LGBTQ rights, to Black Lives Matter and excoriations of xenophobia. 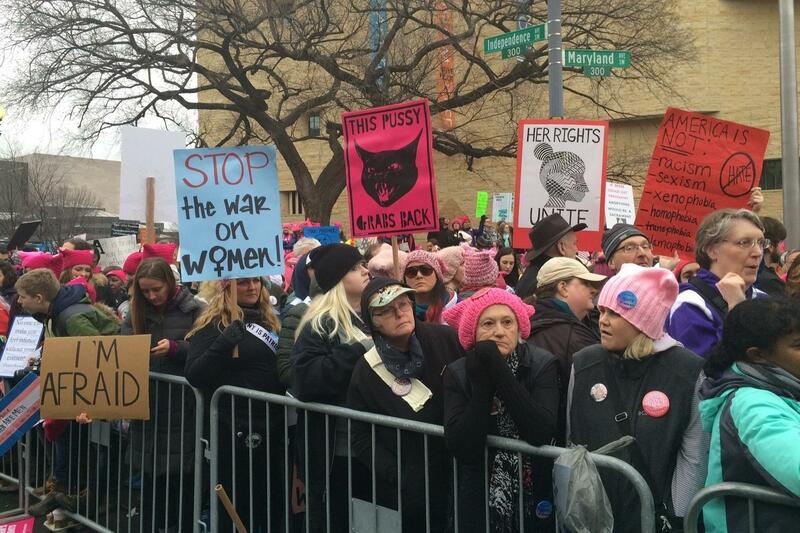 One thing seemed to be almost universal, though: The pink knitted caps known as "pussyhats" among the marchers, in protest of Trump's past comments about women. 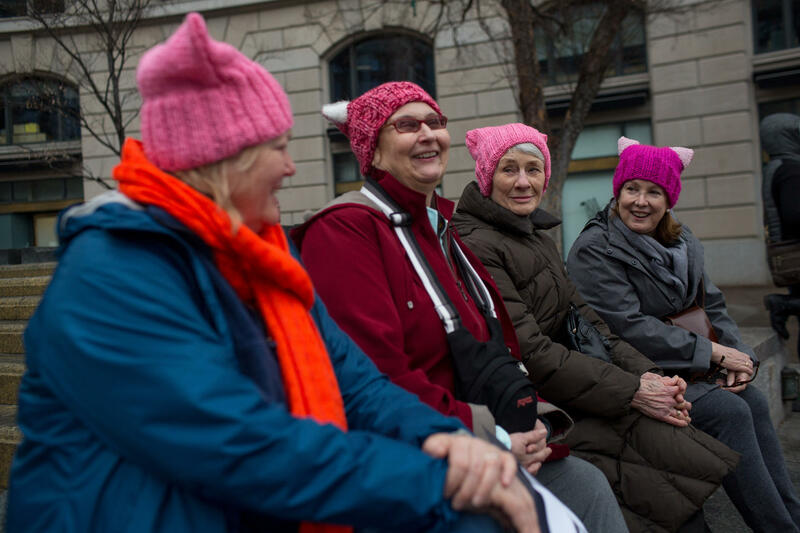 Popular as they may have been, the pussyhats were not the only costume worn by marchers. Others wore their causes on their sleeves, dressing in attire to call attention to issues like Native rights and environmental fears. In video Sarah recorded a block or two from the main rally, it appears there were marchers in a menagerie of outfits. 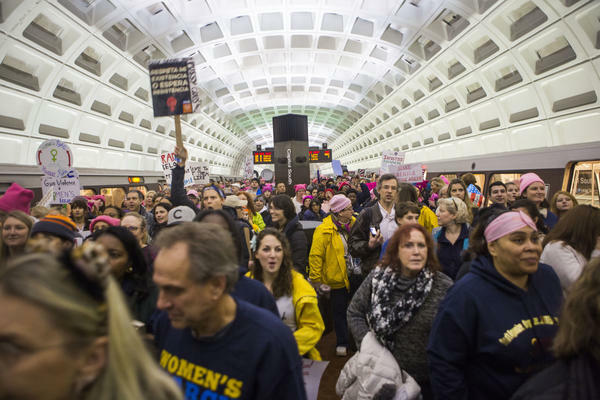 Meanwhile, at a nearby metro station, NPR's Pam Fessler reported the mood among the demonstrators has been more festive than protests Friday. Most of the demonstrators are women, Pam says, but some men have joined the march, as well — including one man carrying a sign reading: "This is what a feminist looks like." From the main rally stage, musicians and speakers addressed the crowd in an event that lasted some five hours — more than two hours longer than anticipated. The reason for that overflow was partly its smattering of surprise guests. Beyond the planned performances and speeches from figures like Janelle Monáe and Gloria Steinem, others including Madonna and Alicia Keys took the stage. "It was woman that gave you Dr Martin Luther King Jr. It was woman who gave you Malcolm X. And according to the bible, it was a woman who gave you Jesus," Monáe told the crowd, according to The Guardian. What began simply as opposition to Trump has developed a wide-ranging list of demands, which organizers published as a platform prior to the march. But above all, organizers say, is the principle that "Women's Rights are Human Rights and Human Rights are Women's Rights." That statement is pulled directly from a speech Hillary Clinton delivered more than two decades ago in Beijing. Clinton tweeted her support for the march Saturday, expressing thanks "for standing, speaking & marching for our values." Arriving at that platform was not always a smooth process, though. NPR's Hansi Lo Wang reports there has been disagreement between organizers about how to treat issues of race. "This march was initially put together by white women, and a lot of women of color felt they weren't part of the conversation," Carmen Perez, one of the march's national organizers, told NPR's Hansi Lo Wang. "We can't continue to work in isolation. We can't continue to be one-dimensional. We have to make sure that we look up, that we begin to really coordinate our efforts." Ultimately, more than 200 organizations — ranging from Planned Parenthood and the NAACP, to Amnesty International and the AFL-CIO — partnered with the Women's March on Washington. For Darcy Sawatzki, a demonstrator attending the march with her daughter, Delia, what matters most is showing up. "I think showing up and paying attention is sort of one of the bare minimums of citizenship," Sawatzki told NPR's Brakkton Booker. 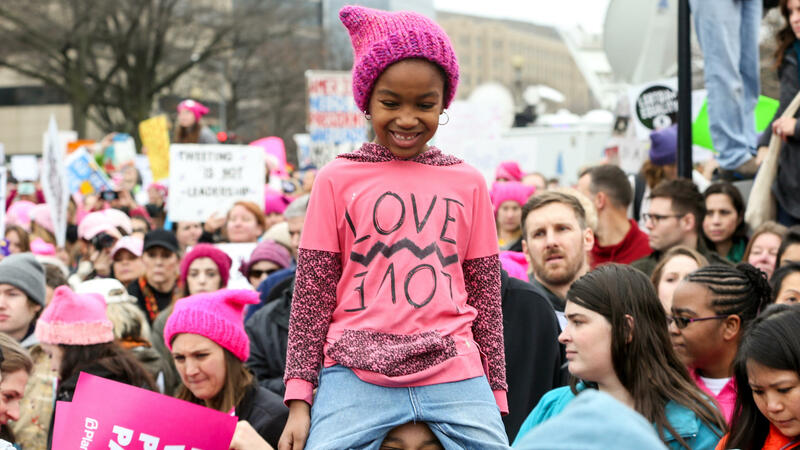 It's not her first march; she has also participated in Black Lives Matter protests. She said it's not unease with the new president that inspired her to march. "I'm not here out of anger or fear, I'm out here for determination, for participation and hope that together we can make a difference." Donald Trump has been sworn in as the 45th president of the United States. 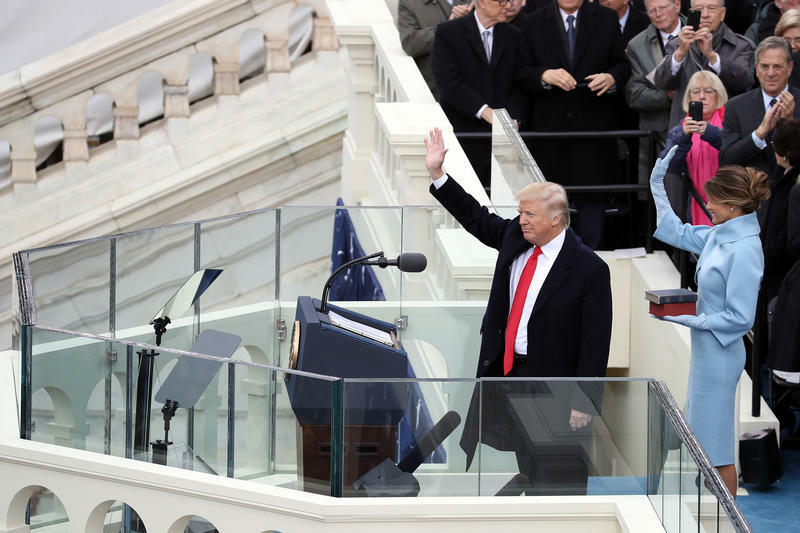 Below is the transcript of President Trump's inaugural address as well as notes and analysis from NPR reporters and editors. 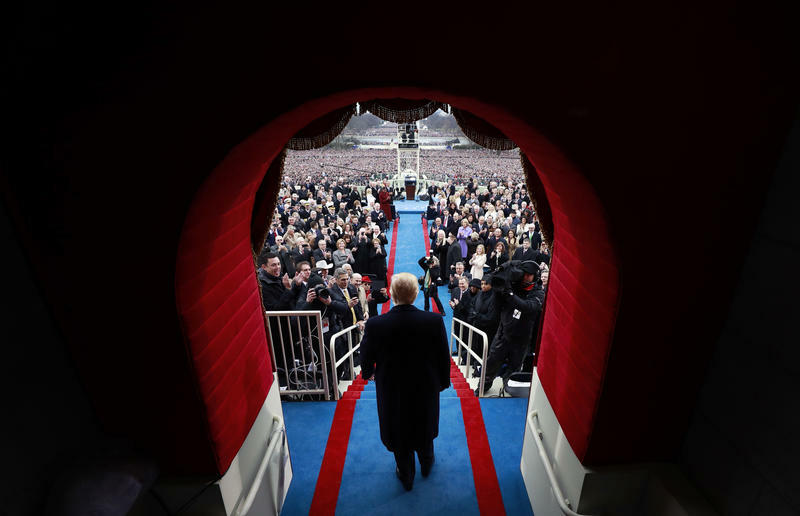 A newly inaugurated Donald J. Trump delivered a fiercely populist and often dark address, promising to transfer power in Washington from political elites to the people and vowing to put "America first." Surrounded by members of Congress and the Supreme Court, the nation's 45th president repeated themes from his historic and divisive campaign message, describing children in poverty, schools in crisis and streets pocked with crime and "carnage."